Amazing Schott Zwiesel Tritan Crystal: the secret of 5 star restaurants. Don't be fooled by the delicate and beautiful appearance of Schott Zwiesel wine and cocktail glasses! Made in Germany of patented Tritan crystal, they are so incredibly strong and resilient that they almost never chip. Tritan crystal is made using titanium rather than the lead in most crystal. This change results in an extremely strong, and durable glass. Another tremendously unusual benefit of Schott Zwiesel: it's dishwasher-safe! These glasses won't cloud, even after being through the dishwasher hundreds of times. Dozens of designs for every kind of wine, every kind of cocktail. We are proud to offer Schott Zwiesel glassware made from Tritan - the strongest crystal in the world - at discount prices. Break resistant and completely dishwasher safe, this quality stemware will quickly become a necessity in your kitchen. Click here to read the complete amazing Schott Zwiesel Tritan story. Schott Zwiesel (sometimes misspelled as "scott zwiesel" or "schott zweisel") sets the standard for barware. Schott Zwiesel wine glasses, drink glasses, beer glasses and decanters are sold throughout Europe and the USA to the most discerning buyers. 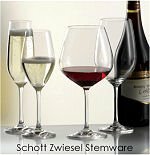 If you need wine glasses for an important dinner or champagne flutes for New Years or beer glasses for game day, Schott Zwiesel has something to fill your needs.